No matter where you are in the U.S., reminders are everywhere – it’s winter. Whether it’s a polar vortex, just plain cold, or driving rains, it’s the dead of winter, almost exactly half way between the first day of winter and the first day of spring. It’s cold and wet across most of the country. Even here in sunny Southern Cal, we are getting pelted by heavy rain three of the last four days. The forecast is for some sunshine mid-week, but temperatures topping out in the 50s. That won’t get us any sympathy from those living with wind-chill factors in the minuses, but it’s all relative, and in Southern California, two weeks of nothing higher than 59 is a cold snap. So, what do we do about it? We make soup. Through the years, we’ve published a number of original recipes for soup. (https://www.tabletalkatlarrys.com/category/recipes/soups/) You can start with any of those. But today, for some unexplained reason, I got an itch for one we haven’t shared before – Seafood Gumbo. It will have to wait a few days, because today is Super Bowl Sunday and I’m going to watch the game at a friend’s house. As a silly side note: how does a Brooklyn street kid, who has lived most of his life in Los Angeles, come to develop a taste for and a recipe for gumbo? But then, one of my favorite breakfasts is pork chops and eggs with grits. I didn’t learn that in Brooklyn either. 1. Cook the rice in salted water according to package directions until tender, then drain and set aside to cool. 2. In a large frying pan, heat the oil. Add the onions, celery, garlic and bell peppers. Stir over medium heat for 5 minutes, or until soft but not colored. Mix in the tomato paste and stir for 1 minute, then add the stock, oregano, and okra to the pan. Cover and simmer for 15-20 minutes, or until the okra is tender. 4. Remove the shells from the shrimp. (see note 1 below.) 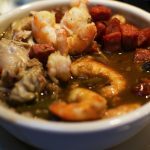 Skim the gumbo to remove any oil or foam, then return to the stove, add the fish, crab and shrimp and simmer for two minutes. Add Tabasco and Worcestershire sauces, stir in the rice and bring the gumbo back to a simmer. Taste and add salt, pepper or sauces if necessary. Ladle into bowls, sprinkle on filé, and garnish with scallions. (NOTES: 1) If you have no fish stock, just put the shrimp shells in a pot with about 4 1/2 cups of water, bring it to a boil and simmer for about 20 minutes. Strain it into a one-quart measuring cup and discard the shells.